Elastomeric sheet compounds mark the entry level to Klinger's sheet-sealing range of products. Consisting of base polymers with the insertion of vulcanising agents, fillers, pigments and various additives, elastomeric gaskets offer effective, low sealing stress seals typically for low temperature, low pressure applications. Elastomeric gaskets have relatively soft compression characteristics requiring relatively low loads to effect a seal, incorporated with excellent recovery properties due to their self-energising behaviour. Natural rubber exhibits exceptional elongation, tear strength and recovery properties. for use against amines, esters, ketones, steam or low temperature service. far superior to any other grades. They are also unaffected by sunlight and ozone. Butyl rubber offers excellent resistance to acidic and alkaline environments. Excellent weathering properties and ozone resistance. Low permeability to gases. weathering. It also exhibits good aging, abrasion and heat resistance properties. Hypalon also has low gas permeability. Hypalon offers poor resistance to fuels. KLINGERLASTIC elastomers are available in a range of thicknesses and sizes. 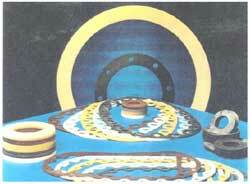 Some elastomer types are available in a range of colours and with reinforcing insertion. Note the above properties and limits are intended as a guide only and may vary depending on the application conditions. If a specific recommendation is required, please consult Klinger for advice.